Pretty little decorative bird block that will brighten up any home. Perfect as a little paperweight, a little gift idea or could be used as part of a wedding table decoration to add that heartwarming feel. 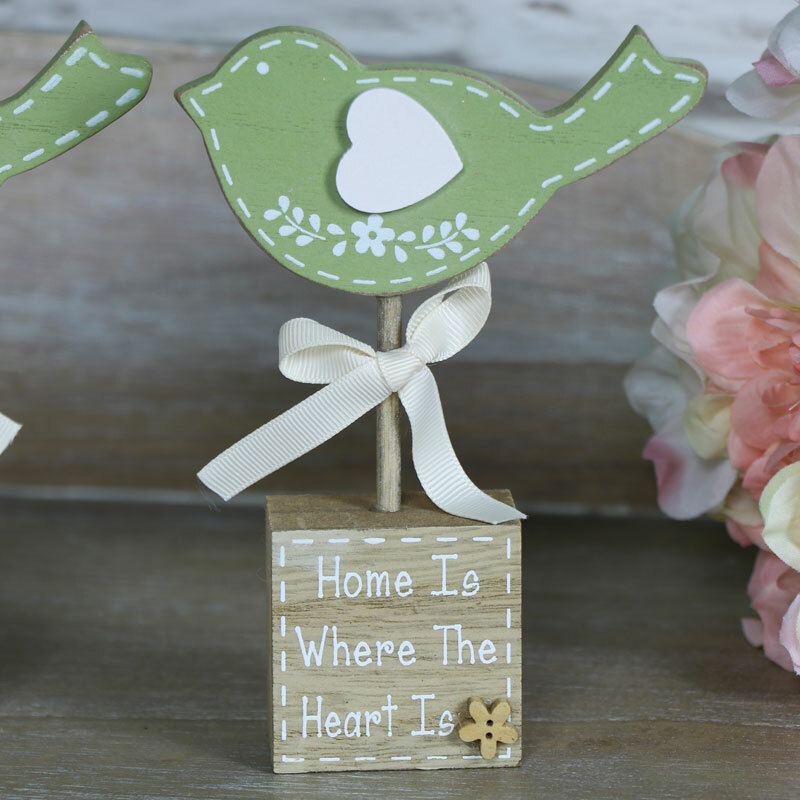 Two little birds, in a pale green colour, each perched on top of a little wooden block with a sweet sentimental quote. Touching quotes that are sure to make you smile, "Home is Where the Heart is" and "Be the Reason Someone Smiles Today". Pretty little decorative bird block that will brighten up any home. Perfect as a little paperweight, a little gift idea or could be used as part of a wedding table decoration to add that heartwarming feel. 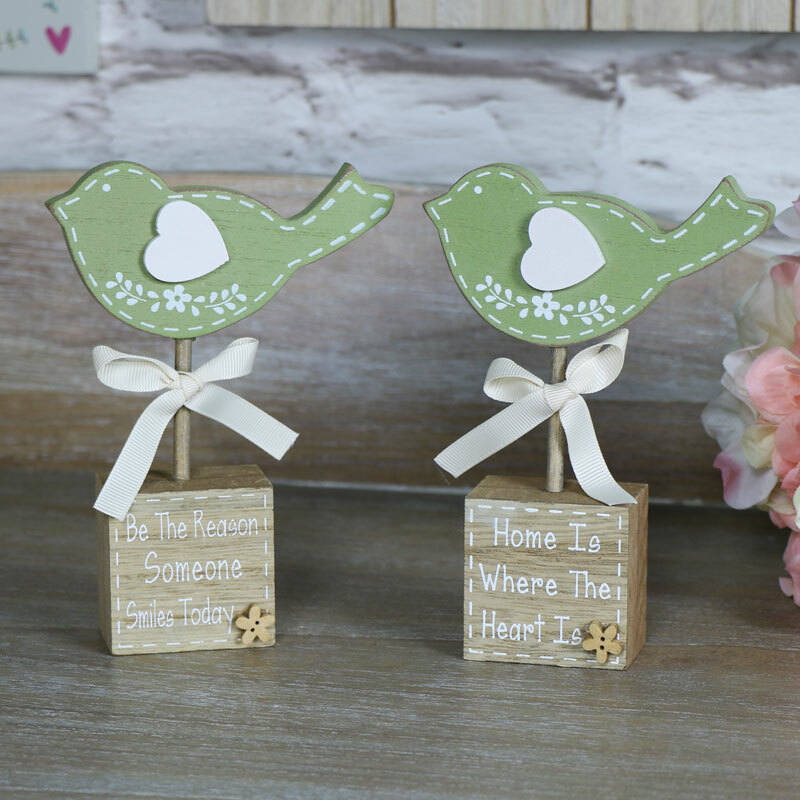 Two little birds, in a pale green colour, each perched on top of a little wooden block with a sweet sentimental quote. Touching quotes that are sure to make you smile, "Home is Where the Heart is" and "Be the Reason Someone Smiles Today". Little wooden bird, painted in a pale green colour with little white heart for a wing, each bird sits on a little wooden block with printed quote in white text. We have the perfect range of gift and accessories for you to choose from. Whether it's just a thoughtful little gift to say 'thank you' or a present for birthdays, weddings, anniversaries or simply something for yourself we have something for you.